A 2014 article of McKinsey & Company deals with what is called “reshoring”, meaning relocating factory closer to the customers. Labour cost is no longer the only driver we should look at when building a manufacturing strategy – it is time to take into account new constraints. Increased transportation costs, higher wages in developing or newly developed countries, and new technologies have changed the game. The Supply Chain organization tightly depends on the manufacturing organization. Running distant mass production centres was the standard model, although it tends not to be relevant anymore. This manufacturing model consists of numerous transportation stages, as well as important warehousing. With transportation costs increasing consistently following volatile oil prices, the centralized model is questioned increasingly. This is why one of the latest trends is the outsourcing of production processes to companies in a nearby country, often sharing a border with the target country. It enables industrials to reduce risk as well as transportation costs when moving from a global to regional strategy. Shortening the distance between production and distribution however doesn’t drastically shorten the supply chain: the number of stages especially does not necessarily decrease. For example, many US companies stopped outsourcing their production in Asia to reduce the logistics costs (distance & time), and have now factories in Mexico. This trend is called reshoring. The products are produced closer to their consumption place, yet there are still many supply chain stages: different production places (components and final good assembly), different warehousing places, different distribution places, and, as a result, many carriage and transportation stages. Reducing the number of miles the product will go through is one thing, but it is not enough to make an cost-efficient supply chain. 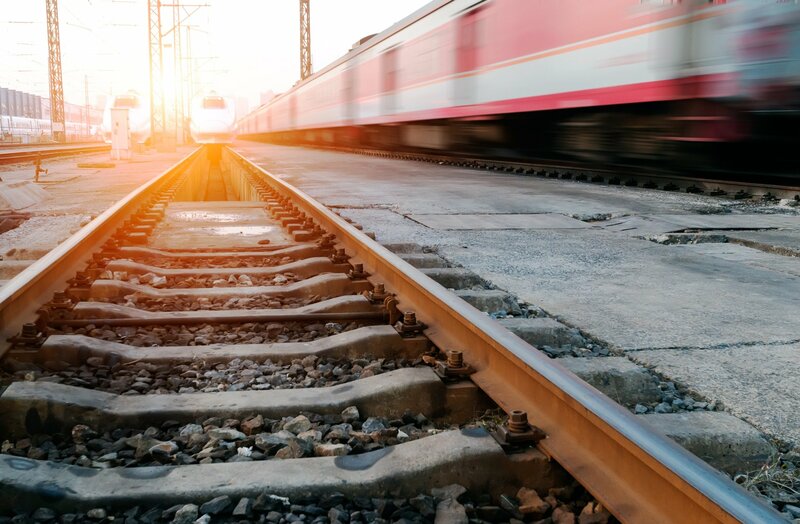 First and foremost, the overall supply chain should not be confounded with logistics, which only refers to the movement of the product through the supply chain. Supply chain also gives rise to high inventory and warehousing fees, which one should try to reduce or even avoid. The main challenge of the supply chain is therefore its simplification, as a heavy supply chain undermines efforts to build a low-cost production system. 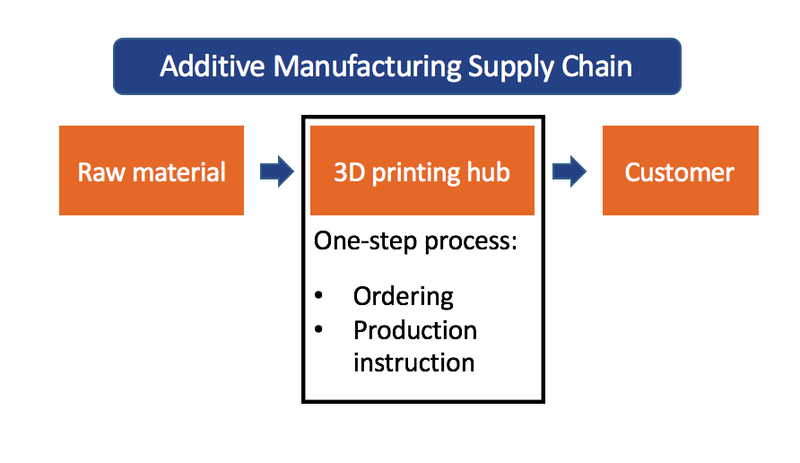 Additive manufacturing changes this existing situation, offering geographical flexibility and simplifying material supplying and production processes. This technology offers three critical assets, which help to shorten the supply chain. First, it is a one-step process without any fragmented manufacturing. In other words, we avoid manufacturing each component separately and then having to assemble. Second, additive manufacturing phases out the physical inventory thanks to digitalization. Third, 3D printing enables on-demand production at a local scale, the product is delivered to the customer with the shortest delay and thus, allows for the omission of retailing and distribution stages. It would be wise to take advantage of these properties. Some logistics companies like Jabil and UPS are already thinking of 3D printing to save time and money while manufacturing and implementing machines in their hubs. They are imagining a mixed supply chain, twisting the traditional model with 3D printing technology, and this way they actually shorten the overall process. It is definitely a stride towards more flexible production and shorter supply chain, but the properties of additive manufacturing enable further progress. As a 3D printing machine can be set anywhere with little investment, it is viable to push production closer to the final consumer. In addition, additive manufacturing is now massively used, and finding a 3D printing outsourcer (also known as service bureau) in different areas is easy. Thus, it is simple to leverage on existing manufacturing capacities, without investing in any new infrastructure, but operating through a model based on communal resources. Once you build a dense network of providers, it enables you to produce locally. So what if production is located close to the customer? The result is reduction of the supply chain to only two stages, while the traditional system gathers more than eight steps, and the mixed one no less than four. Production at a local scale cuts the transportation fees, and the simplicity of the production process (one-step, without tooling) makes it quick. The model of mass production in distant production centres was considered as an obvious choice, as parts manufacturing cost is extremely low. But the additional costs, especially those associated with transportation and logistics, should be taken into account quite seriously. Running an inventory requires warehousing, manpower, insurance, logistics work, all of which cost time and money. This established situation should not last any longer, and a digital transition has to be made. We are used to thinking of a digital database (for instance, the directory of your cell phone) when it comes to information, but it is difficult to imagine that the same model could be applied to physical objects. Decades ago, you would have not thought that it is possible to register your repertory in your phone memory, as the little notebook seemed so solid and real. The transition is the same for industrial objects – keeping their production information in a digital inventory is enough to ensure efficient and reliable aftermarket service, as 3D printing is a means of fast production without the need for tooling. A physical part can be produced within a few hours through its digital model, phasing out the burdensome physical option. Digital inventory avoids dealing with a thorny issue, and eases the supply chain management at lower cost. New manufacturing means enabling the supply chain to be transformed, improving its management and efficiency. Shorter supply chain cuts transportation, warehousing, and inventory costs. Therefore, when it comes to supply chain, one should keep in mind that the shorter is definitely the better.